HVAC usually refers to the mechanical system of the building that provides heating, ventilation and/or cooling within a building or a premise. High-end in-built BMS system to improve the overall energy efficiency, controls, monitoring, performance. 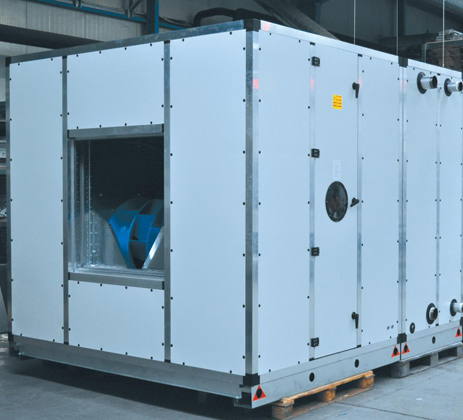 An Air Handling Unit is a central air conditioner station that handles the air that, usually, will be supplied into the buildings by the ventilation ductwork (connected to the AHU). Handling the air means that the air will be delivered into the building spaces with thermo-hygrometric and IAQ (Indoor Air Quality) treatment. The accuracy of the treatment will depend from the specificity of each project. This means, the Air Handling Unit treat the air by filtering, cooling and/or heating, humidifying and/or dehumidifying. Chempharm offering the total facility Solution as per EU GMP/PICs (PHARMACEUTICAL INSPECTION CONVENTION)/U.S. FDA/ W.H.O Compliance. 1) Cleanroom Architecture – Materials of construction and finishes are important in establishing cleanliness levels and minimizing the internal generation of contaminants from the surfaces. Supplying airflow in sufficient volume and cleanliness to support the cleanliness rating of the room. Introducing air in a manner to prevent stagnant areas where particles could accumulate. Filtering the outside and re-circulated air across high efficiency particulate air (HEPA) filters. Conditioning the air to meet the cleanroom temperature and humidity requirements. Ensuring enough conditioned makeup air to maintain the specified positive pressurization. 3) Interaction Technology – Interaction technology includes two elements: (1) the movement of materials into the area and the movement of people and (2) maintenance and cleaning. Administrative instructions, procedures and actions are necessary to be made about the logistics, operation strategies, maintenance and cleaning. 4) Monitoring systems – Monitoring systems include a means of indicating that the cleanroom is functioning properly. The variables monitored are the pressure differential between the outside environment and the cleanroom, temperature, humidity and, in some cases, noise and vibrations. Control data should be recorded on a routine basis. HVAC systems in cleanrooms are substantially different from their counterparts in commercial buildings in terms of equipment design, system requirements, reliability, size and scale. A cleanroom differs from a normal comfort air conditioned space, in the following ways. Increased Air Supply: Whereas comfort air conditioning would require about 2-10 air changes/hr, a typical cleanroom would typically require 20 – 60 air changes and could be as high as 600 for absolute cleanliness. The use of high efficiency filters: The use of high efficiency particulate air (HEPA) filters having filtration efficiency of 99.97% down to 0.3 microns is another distinguishing feature of cleanrooms. The HEPA filters for stringent cleanrooms are normally located at the terminal end and in most cases provide 100% ceiling coverage. Room pressurization: The cleanroom is positively pressurized (to 0.05 in-wc) with respect to the adjacent areas. This is done by supplying more air and extracting less air from the room than is supplied to it. Reciprocating/Screw/Scroll type Chiller Unit with VFD Controller. DX Unit/VRF unit Built-in PLC System for Low tonnage requirement. Hot Water Generator with Built-in PLC for Winter Heat/ Monsoon Reheat requirement. CHW/CDW pumps with VFD Drive to control the speed as per demand. Air Handler with centrifugal plug fan or DIDW Backward Curve fan has been select for controlled flow air based on the Flow & Static Pressure requirement of Varies application. Dehumidifier/ Humidifier System to Maintain the Inside RH/Tem all-round the Year. Heat recovery System to enhance the power saving. Thermal Filtration System with HEPA (H-13) or ULPA (H-14) filter where ever required as per Clean Room Classification. 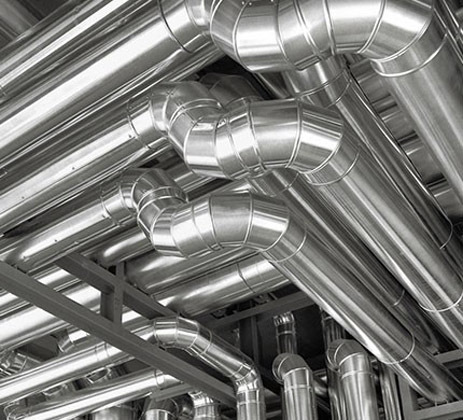 Factory built Square, Round or Oval Ducts having slip on or TDF type flanges based on the line / system pressure and requirements – All ducts are built as per ASHRAE 2012 Duct construction Standard.